Effective psychotherapy for depression that has lasted for years is needed because chronic depression (lasting two years or longer) develops in up to a third of people with an episode of major depression. Chronic depression is associated with more suicidality, more impairment in functioning, and more hospitalizations. Chronic depression psychotherapy is often less effective than therapy for other forms of depression. The Cognitive Behavioral Analysis System of Psychotherapy (CBASP) was specifically developed as an intensive psychotherapy for treating chronic depression. Previous studies found that CBASP alone was as effective as medication treatment for chronic depression, and the combination of two treatments was even more effective. In a subgroup of patients with chronic depression and childhood trauma, CBASP outperformed medication in terms of rates of remission. In a study published in early 2017, there is further evidence that CBASP is more effective than treatments not developed to treat chronic depression (non-specific psychotherapy). This study is an important one because it has been relatively hard in psychiatric research to find clear evidence that disorder specific therapies are more effective than non specific psychotherapy. To find a clinically significant difference is noteworthy. The treatment included 24 sessions of CBASP or SP for 20 weeks in the acute phase, followed by 8 continuation sessions during the next 28 weeks. 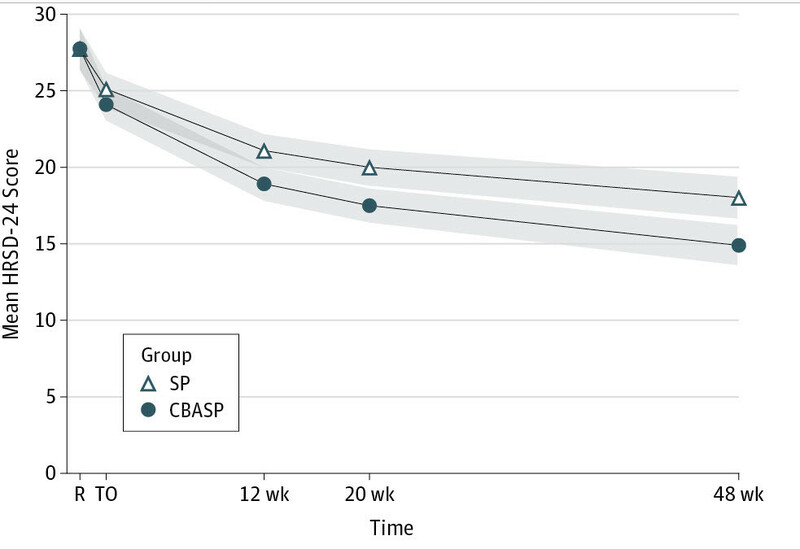 In this randomized clinical trial of 268 adults, patients not taking antidepressant medication who were treated with the Cognitive Behavioral Analysis System of Psychotherapy reported significantly less severe depressive symptoms after 20 weeks than those who received nonspecific psychotherapy. McCullough JP. 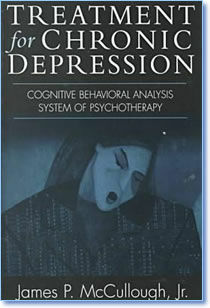 Treatment for Chronic Depression: Cognitive Behavioral Analysis System of Psychotherapy. New York, NY: Guilford Press; 2000. Keller MB, McCullough JP, Klein DN, et al. A comparison of nefazodone, the Cognitive Behavioral-Analysis System of Psychotherapy, and their combination for the treatment of chronic depression. N Engl J Med. 2000;342(20):1462-1470. Kriston L, von Wolff A, Westphal A, Hölzel LP, Härter M. Efficacy and acceptability of acute treatments for persistent depressive disorder: a network meta-analysis. Depress Anxiety. 2014;31(8):621-630. Schramm E, Zobel I, Schoepf D, et al. Cognitive behavioral analysis system of psychotherapy versus escitalopram in chronic major depression. Psychother Psychosom. 2015;84(4):227-240.